Today, I'm not going to talk about the sweet ^^, because I want to talk about this book, お菓子作りのプロが教える!決定版 お菓子の基本 (Professionals teaching on how to make basic sweet ! )by エコール辻東京製菓研究室, the one that I fall in love now. Actually I got this book for 3 months by now, but I rarely have a chance to take a close look at it, maybe because I have too many new books for a past 3 month, haha. Anyway, after I used this book when making the cheesecake (for Chicken Farm Baker's Project # 25 : My Lover Say Cheese, Parmesan Cheese Cake), I just put it back in the shelf. But last week, when I felt that I didn't have a time to enjoy this book, I take it out again and well, I have to say that "I love it". 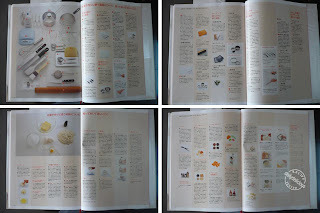 Even I have a lot of books about basic baking but each one has their own style. 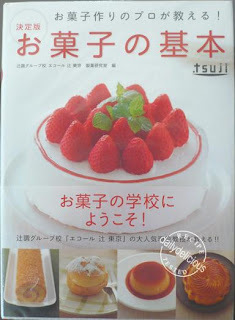 For this book, it's very good for the beginner who want to try many kinds of sweet, and the book start from the most basic things, like the first of the first chapter is "The things you must know before making the sweet". That's about the size of the egg (M size egg for this book), how to sift the flour, and all you need to know BEFORE making any kinds of sweet. Then the book will divided into 9 chapters: 1. Sponge cake & Rolled cake, 2. Chiffon cake, 3. Pound cake & Baked goods, 4. Cheese cake, 5. Tart& pie, 6.Choux pastry, 7.Chocolate& and chocolate dessert, 8. Cookies& biscuit, 9. 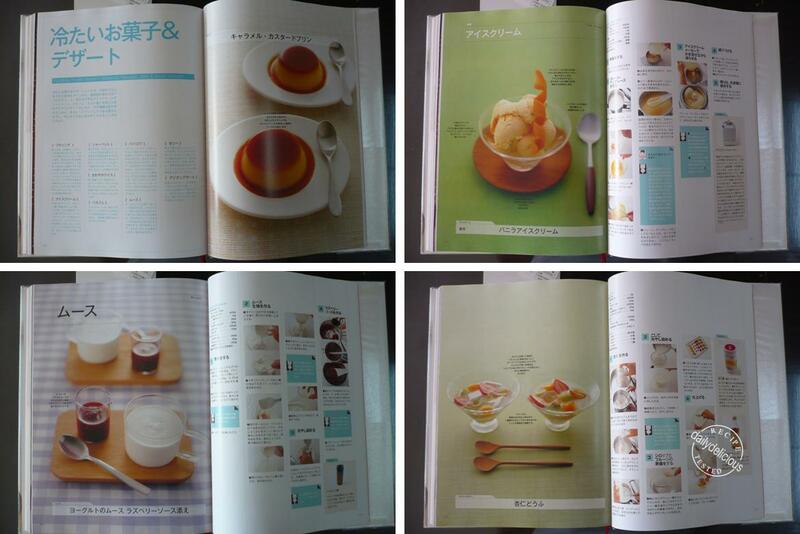 Cold dessert and the last part of the book is how to use equipments and ingredients. Like other Japanese cookbooks, the how-to photos are a lot (I mean "A Lotttttttttt"). 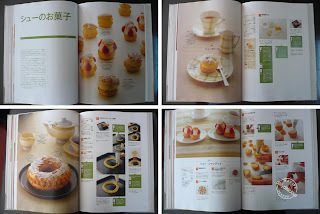 The photos are step by step, (like how-to make the sponge cake has about 35 photos plus the photos of good or failed cake). It like looking at a slide show! And most of them will be like this, the beginning of each chapter will be the basic of how-to (with a lot of photos, haha), and then you will see that with the basic knowledge, you can create a lot of delicious sweet. 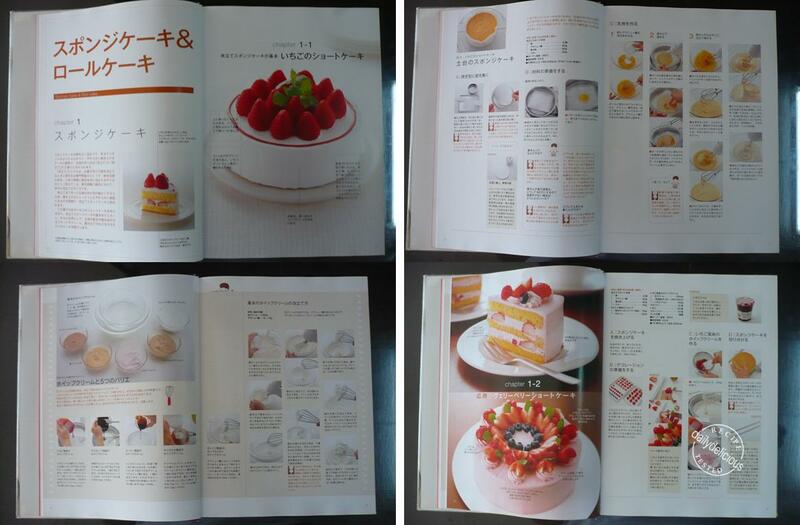 I love the way the book presents, not only you know how to make something, like cake. But you will understand that cake is not just a cake, it can be divided into sponge cake, chiffon cake, butter cake or rolled cake. And each of them has their own characteristic, the ingredients, the method of making it, or the pan that each of them will be put into. So, the best thing that you will get from this book is "an understanding". It is the key to success in baking, because you will know what you do wrong when each problem happen and with that knowledge, you can solve the problem too. I believe that when you really understand what's going on, you can create many kinds of beautiful and delicious sweet, and making all of them will make you happier ^^. 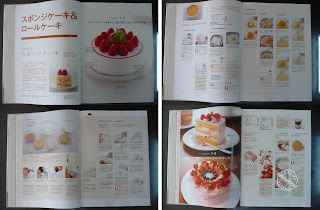 Because there are many kinds of dessert in this book, you can learn the basic of many things, you can make simple things like cakes, cookies, etc. or create more complicate thing like puff pastry, ice cream or even tempering the chocolate. See, how cool this book is ^^. 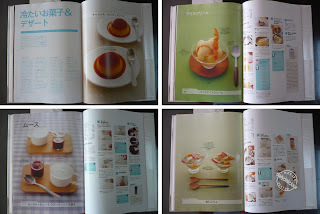 "How to use equipments and ingredient"
The bonus that you will get from this book are lovely photos ( cute, cute and cute, haha), a lot of delicious recipe (about 100 recipes!) and when you can create delicious sweet at home, you will get a smile on your face too, ^^. Well, I know how you feel, ^^. I start learning Japanese because of these book!Haha. Thanks for the review Pook, I have to ask my frd to get this book from taiwan, although I dun understand Japanese but luckily there is a chinese translated version. i have this book too! 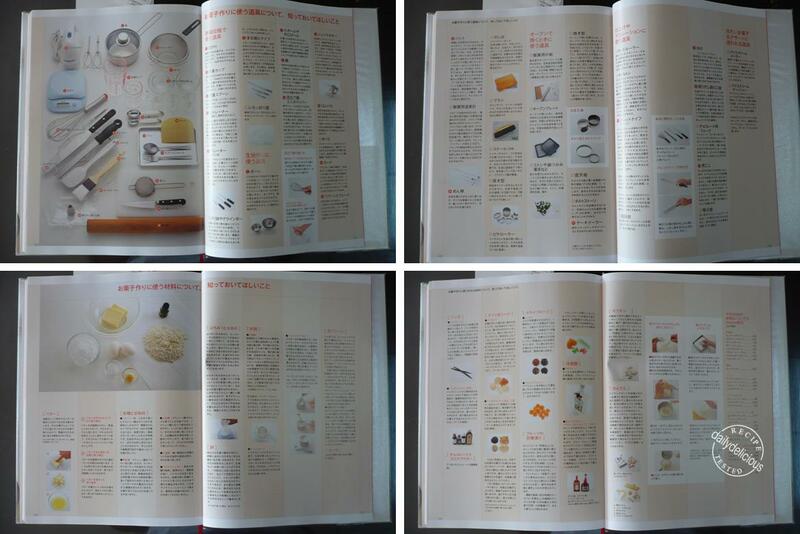 Same like you, I started to seriously learn japanese since I started buying Japanese recipe books. And all the reicpes work very well so far. This is a absolutely great book, and the recipes have truly good results. Really love it! I bought it some time in June, and have tried couples of cakes and cookies. The cookie recipes are fantastic. The real buttery cookie taste is heaven! It's really good that you can find the Chinese version! Yes, I'm the same, I love all of them and I study Japanese because I want to read them too.